Last week, I wrote about winter salads for the Jerusalem Post and today, I want to share this how-to guide with you. What are your favorite ways to prepare hardy greens and root vegetables? As February rolls around and Punxsutawney Phil predicts mild months ahead, cravings for spring and summer produce sneak up on us. But before jumping into warm weather salads – a celebration of a ripe vegetable or two and a few delicate greens adorned with just a splash of olive oil and lemon juice – savor the lingering vestiges of winter. Though winter salads take a little extra planning and some imagination to coax out the flavors of hardier greens and root vegetables, their complexity might leave you longing for them as the first few buds push their way through the melting snow and the farmers markets reopen. While there’s no rule that salad must contain greens, most do. Case in point, Shakespeare’s Cleopatra inextricably linked salads with the color green, reflecting on her youthful “… salad days, / When I was green in judgment, cold in blood…” Winter leaves tend to be more bitter and thicker than their summer counterparts. On first blush, this probably doesn’t sound like much of an endorsement. But winter salads were made for dressing, which, etymologically speaking, may indicate that they are closer to the origins of salad than their summer brethren: the word salad is derived from the Latin sal (salt) and refers to the salty pickling brine that dressed Roman greens. Peppery arugula, radicchio (purple, but still in the greens category) and mustard greens can stand up to a more assertive dressing with extra acid, and a little sugar can tame the piquant spice. Give anything that you’re used to seeing cooked – kale, collards, cabbage – a little extra time to soak up the dressing in order to soften and wilt the greens. If you want to keep things basic, squeeze a lemon over the greens, and then let a fried egg do the work, its creamy yolk coating the leaves. Winter vegetables are transformed by roasting which brings out their natural sweetness. Crank the oven above 400°F and throw in your vegetables, doused in the holy roasting trinity of olive oil, salt, and pepper and spread out on foil-covered cookie sheets. The trees – stalks of broccoli and cauliflower – take fifteen to twenty minutes. Most roots – chopped carrots, parsnips, squash, and potatoes – should roast for thirty to forty-five minutes. And tightly-wrapped parcels of beets need up to ninety minutes, depending on their size, until a sharp knife or toothpick can pierce the flesh easily. Don’t be daunted by the extra preparation time; instead, uncork some wine and pop in a movie while you roast up loads of vegetables. Then keep them in the refrigerator for three to four days, grabbing one or two for salad or to mix with pasta or to serve just as they are alongside a steak. Cold weather salads benefit from contrast. Bright colors excite the eye and prepare the palate: think fuchsia beets and golden squash atop dark green leaves. Add unexpected texture from beans, lentils, or chewy grains such as wild rice, farro, or barley. (Check out Cook’s Illustrated‘s recently published “beyond rice” guide for helpful hints on preparing grains that you may be less familiar with.) For a burst of juice, top with pieces of apple or pear, sections of grapefruit, or pomegranate seeds. Shave or crumble come cheese, such as parmesan or feta, for added richness. And then, what truly elevates any salad is something crunchy. Toast some nuts or seeds in the oven (a toaster oven works great here too) or in a pan. And that stale bread? Chop it into cubes or grind it into coarse crumbs, season, and brown in the oven. Before you know it, you’ll be greeted by those first fiddleheads ferns and morels and white asparagus and artichokes. But for the next few weeks, follow this basic formula for winter salads and don’t let the best of the season pass you by. This salad is adapted from a Yotam Ottolenghi recipe published earlier this year in the Guardian. 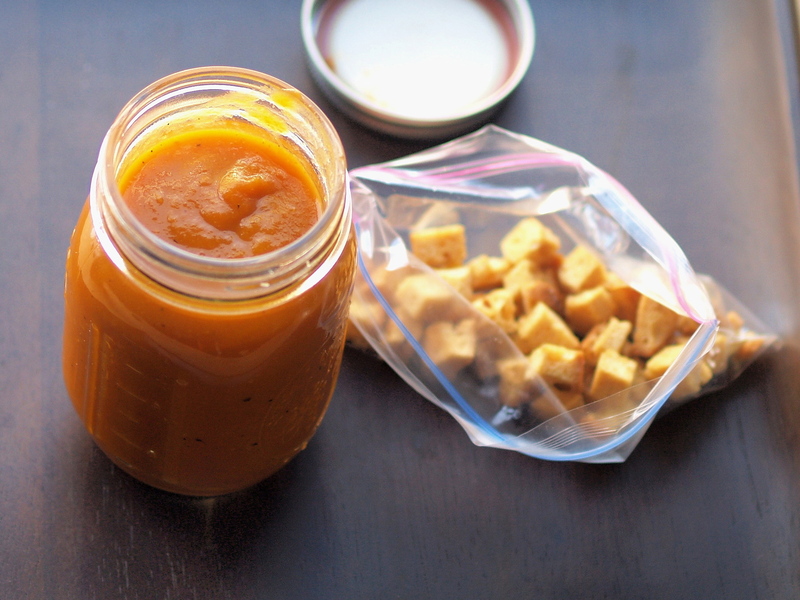 You’ll probably have leftover dressing that you can store in the refrigerator. Toast. Cut the stale bread into bite-sized cubes (approximately 1 cup). Toss with 1 tablespoon of oil, 1 teaspoon of sumac, and a pinch of salt and grind of pepper to taste. 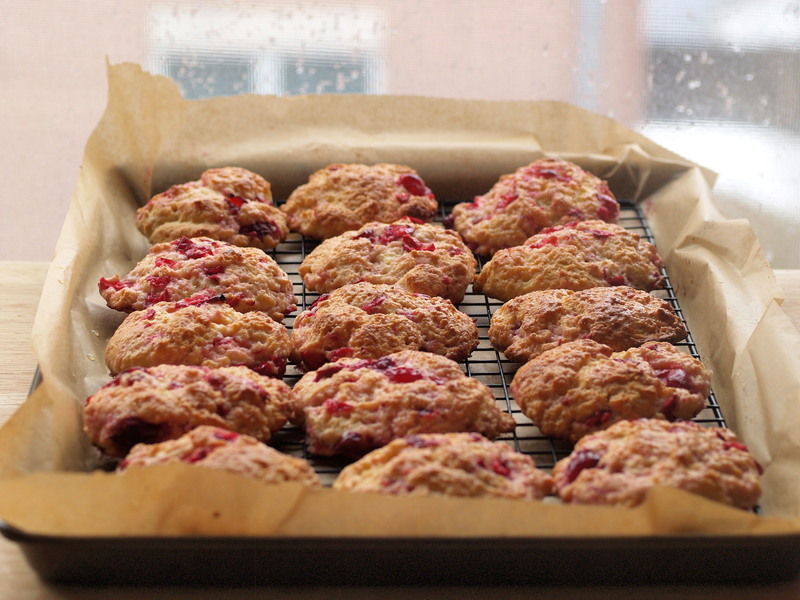 Spread in a single layer on a cookie sheet and toast in a 300°F oven until golden, about 10 minutes. Simmer. Mix the grapefruit juice, sugar, and harissa in a small saucepan and bring to a boil. Lower the heat and simmer until the sauce thickens and you have about 4 tablespoons-worth of juice left – this could take up to 20 minutes. Set aside to cool down, then whisk in the remaining 4 tablespoons of oil, lemon juice, remaining 2 teaspoons of sumac and a quarter-teaspoon of salt. Dip a leaf into the dressing and adjust the seasoning. Peel. Peel the grapefruits and separate each segment like you would with an orange. Separate the flesh from the membranes and break into a few pieces. Assemble. 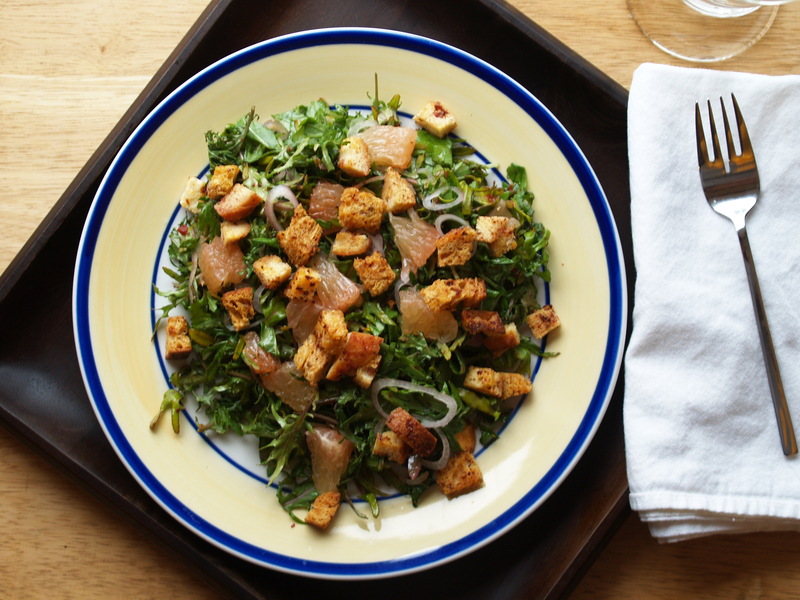 In a large bowl, mix the grapefruit segments, shallot, and greens. Pour over ¼ cup of dressing and toss gently. Add more dressing to taste. Sprinkle with croutons and serve right before serving. Me. Hair blown straight, curled at the ends. Liner and mascara framing my eyes. Black and white knit jacket, zipper on a bias, edged in soft black leather. Black pencil skirt, black tights, black boots balanced on three-inch heels. Head to toe, ready to impress. The room. One long table in front of the window, lined with wine glasses and bottles of red and bottles of white. Ten round tables, ten plates of macarons, ten seated men. The sound of French chatter. Lots of smiles. This is speed dating at the French Library. I walk towards the empty chair, hand plunged into the depths of my purse, feeling for … for what? a pen? my phone? a beret? I don’t remember … for whatever I’m looking for. My fingers fumble over something they don’t recognize. It’s round and plastic and squishy. Eyes locked with my first “date,” I withdraw a totoche. Lilli‘s pink pacifier weighs awkwardly in my palm. I stare down at it. I stare up the man standing in front of me. In my mind, I explain that last night I met my friends’ newborn daughter and, oh là là!, her binky must have fallen into my bag. Out loud I merely say, oh là là! and stuff the totoche back into my bag. I tilt my head and brush back my hair and bat my lashes and shrug. He shakes my hand and says bon soir. We sit down. Here’s a salad that I made for lunch a few weeks back. 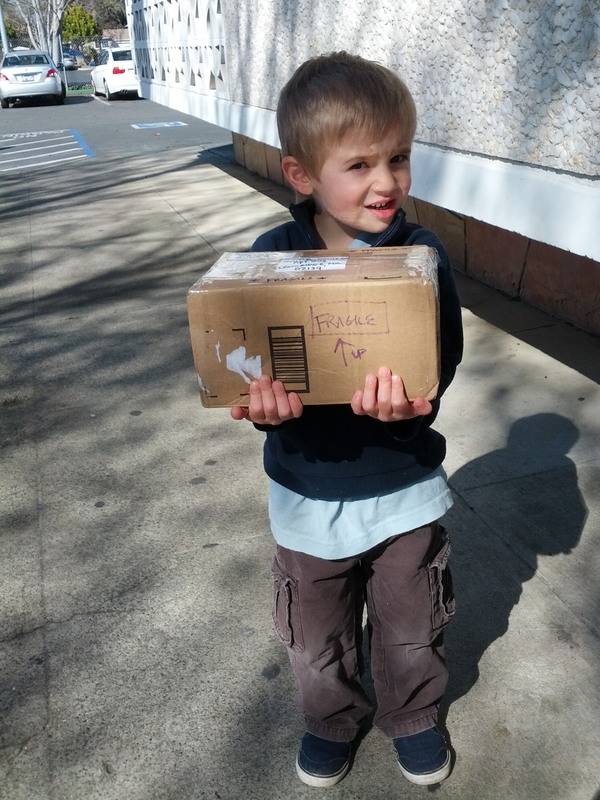 It has nothing to do with this story, but I’ve been meaning to share it for a while. Inspired by a pile of small cucumbers and a bouquet of herbs, I found this tabouli-inspired recipe. 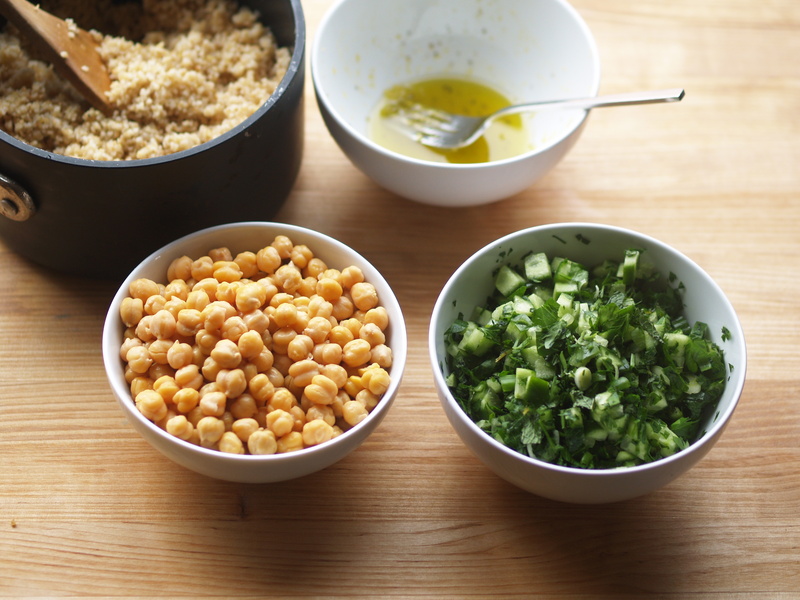 I added the extra step of peeling the chickpeas. This takes about 5 minutes per can and, while some might find it tedious, I find it soothing to fall into a rhythm while letting my mind wander. Simmer. For coarse bulgur: Bring the water to a boil in a medium saucepan. Add the bulgur and salt to taste, reduce the heat, cover and simmer 20 minutes or until the water is absorbed. Remove from the heat, and allow to sit undisturbed for 10 minutes. For medium bulgur: Place the bulgur in a bowl with 1/2 teaspoon salt and pour on 2 cups hot or boiling water. Allow to sit for 20 to 25 minutes, until most of the water is absorbed. Drain and squeeze out the water. Peel. Rinse and drain the chick peas and then peel them. Grasp each chickpea between your thumb and forefinger, apply a little bit of pressure, and the outer transparent skin will slip right off. Each can took me about 5 minutes. Chop. Finely chop the parsley and mint. Cut the cucumber into approximately 1/2-inch cubes. Slice the scallions into thin rounds up until the point where the green turns dark. Shake. Shake in a jar (or whisk in a bowl) lemon juice and olive oil with cumin. Add salt and pepper to taste. Toss. 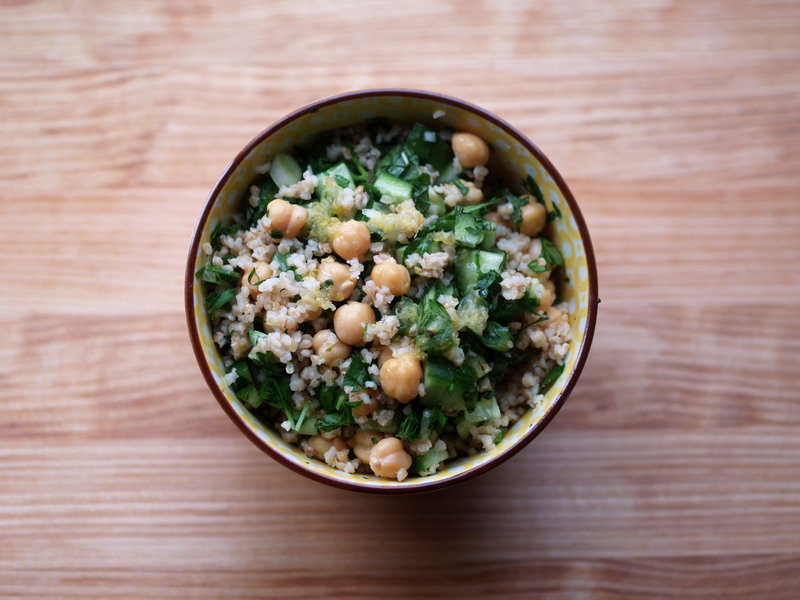 Mix the bulgur, chickpeas, herbs, and scallions in a bowl. Toss with half the salad dressing, adding more to taste. The salad is even better the next day. You might notice that things look a little bit different here today. That there? That’s a little glimpse of my office. Every morning, after the frenzy of coats and hats and scarves come off, I drop my purse on the floor and my lunch, when I remember to pack it, on my desk. Eventually lunch makes its way into the fridge on my first trip upstairs to the kitchen for tea. And let’s talk about that upstairs. It’s where the printer is. It’s where the engineers sit. It’s where the real work gets done. It’s where the couches are. It’s where we gather for lunch. 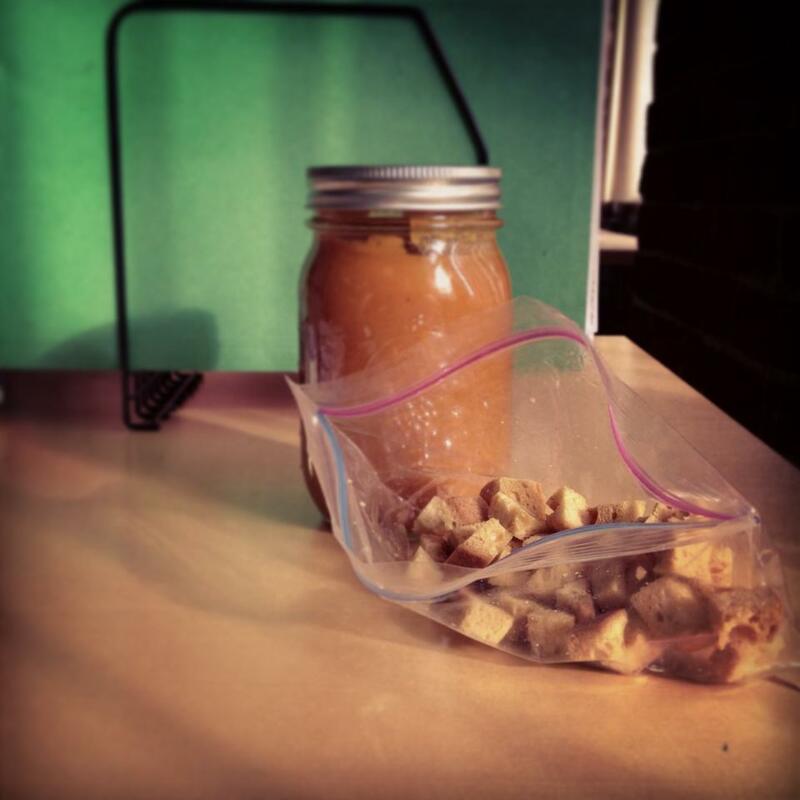 Today I brought in a jar of soup. It was leftover roasted carrot from Sunday’s brunch (thanks Jenn!). And I topped it with croutons, and that’s what I want to quickly chat about today. Yup, we’re going to talk about stale bread. There’s so much you can do with stale bread that I sometimes buy a loaf hoping I won’t be able to eat the whole thing before it dries out. Looking back, I’ve used stale bread quite a bit around here. It’s the star of a salad. Ground into crumbs over another salad. Pureed to thicken cold soups. Rubbed with garlic and floated on a hot soup. 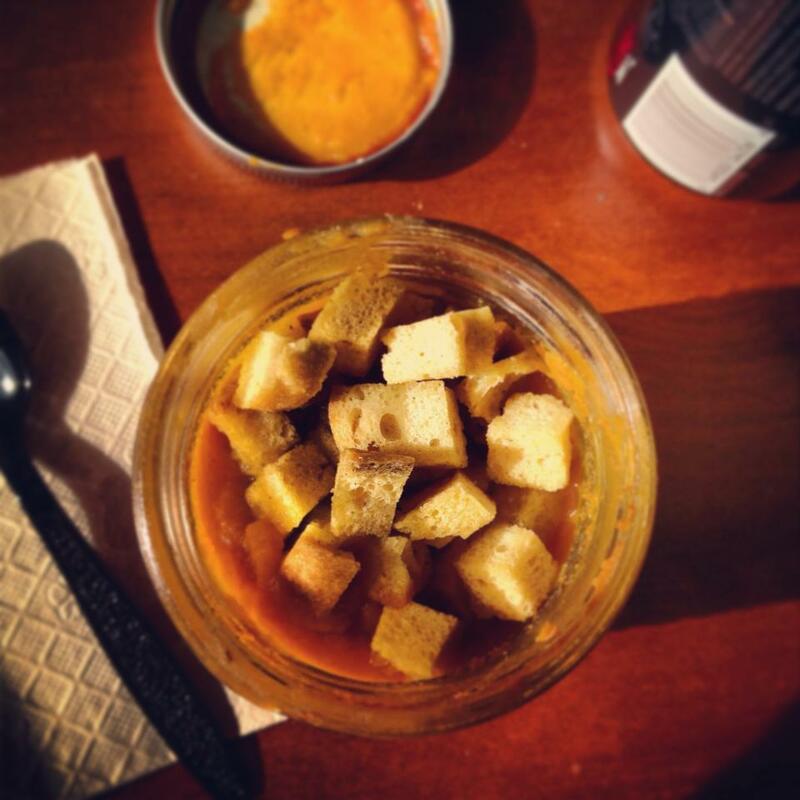 Today’s stale bread works equally well in soups or salads. The trick is to cut it into small cubes, no more than a half-inch on each side. I like to use baguette or a nice boule; you don’t want anything too airy. Toss the cubes with a nice drizzle of olive oil and a few pinches of salt and a few grinds of pepper, maybe even some spices. 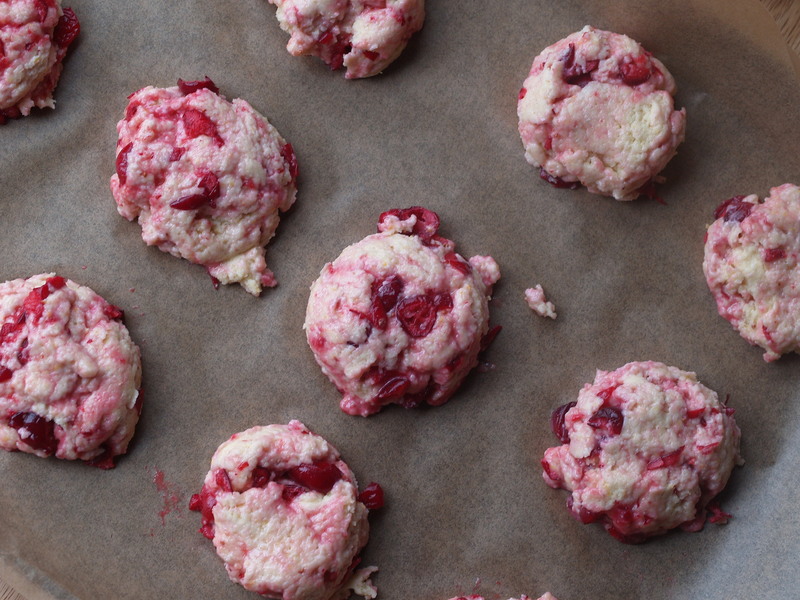 Throw them on a cookie sheet and into the oven at 300° – 350°F for about ten minutes until they start to color. Or toast them up in a pan on the stove for about five minutes. Once they cool, they go into a bag and into my office and onto my desk and up the stairs and into a jar and onto a couch and into my belly. And in case you want a closer look at the soup, here’s a quick picture that I snapped as I packed my lunch in the morning. Most people are watching the Super Bowl as I type. But instead of making chili and guacamole this evening, I threw a brunch this morning. Well before Beyonce rocked the halftime show and a blackout darkened the field (Oreos anyone? ), four lovely ladies knocked on my door, arms full of food. 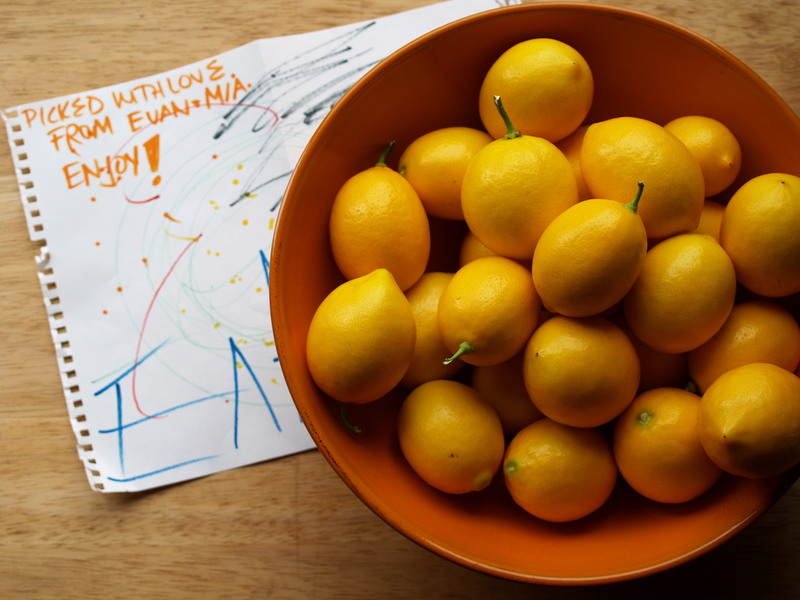 It all started in November with crowd-sourcing recipe site Food52, their second cookbook, and a give-away. I saw an announcement that the first forty people to sign up to host potlucks celebrating the book would receive free books and some other goodies. With a guest list of cooking friends in mind, I offered up my home to other Boston-area Food52-ers and secured the freebies. Four months later, we met and we ate. Jenn walked in first with a blue Le Creuset pot of roasted carrot soup that we set on the stove to reheat. Megan, a friend of mine from high school, showed up with a bottle of Veuve and an apology for not being able to prepare a dish. (Full time job plus working husband plus two boys? No apology necessary, Megan.) Jenn chopped up some thyme in the kitchen while I reached around her to grab silverware and dishes and glasses that Megan set out on the table. We started in on the cheese and pears. I pulled an almond orange cake out of the oven, clipped broccoli trees for roasting, and whisked together a smoked paprika vinaigrette. Another knock on the door, and I took coats from Christine who had driven down from Portland and her friend Elizabeth. Christine brought the nibbles – chevre devils and blue cheese savouries – and her own contribution to the cookbook – decadent salted pumpkin caramels. Elizabeth presented a pan bagnat – salade Nicoise in sandwich form. I lit a fire and we filled our plates, sitting around my coffee table and chatting. Cheers to new friends. So, the game just ended. Let’s celebrate with cake. Let’s mourn with cake. Let’s all eat cake. Adapted from Food 52’s second cookbook, this is a pretty classic yogurt cake, enriched with almond meal and soaked in an orange flower syrup. I made my own almond meal by pulsing almonds in a food processor. I skipped the syrup and instead added orange zest to the cake batter and replaced the vanilla with orange flower water. I used 2% Greek yogurt because it was what I had, but next time I’ll use full fat because the cake didn’t rise as much as I thought it would and was a bit crumbly. 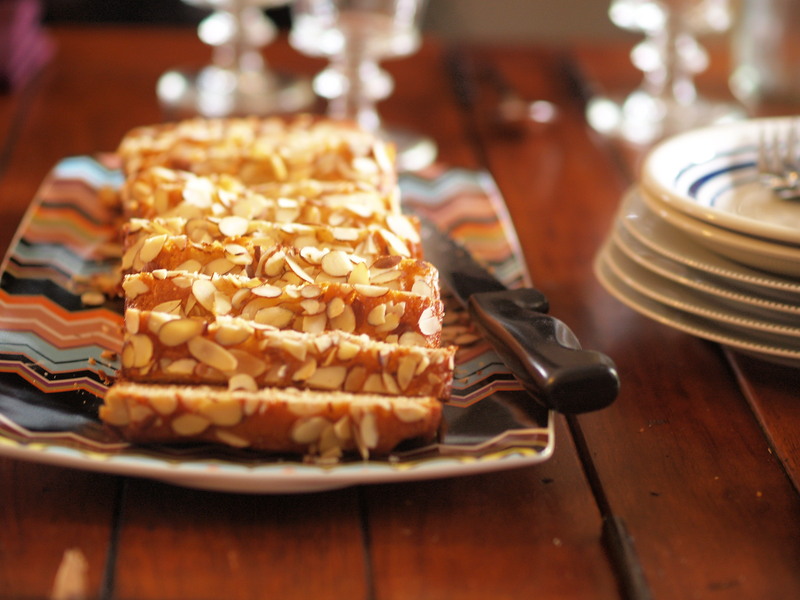 I also think I topped the batter with too many sliced almonds, weighing the cake down. No worries, I’ll be making the cake again. Makes one 9×5-inch loaf pan. Prep. Heat the oven to 350ºF. Grease a 9×5-inch loaf pan. I cut a piece of parchment paper to fit the bottom of the pan to make it easier to lift out the cake. Whisk. In a large bowl, whisk together the eggs, yogurt, sugar, oil, orange flower water, and orange zest. Fold. Switch to a spatula. Mix in the salt, baking powder, and baking soda. Add the flours gradually to the wet ingredients, folding until just combined. Sprinkle. Pour the batter into the prepared pan. 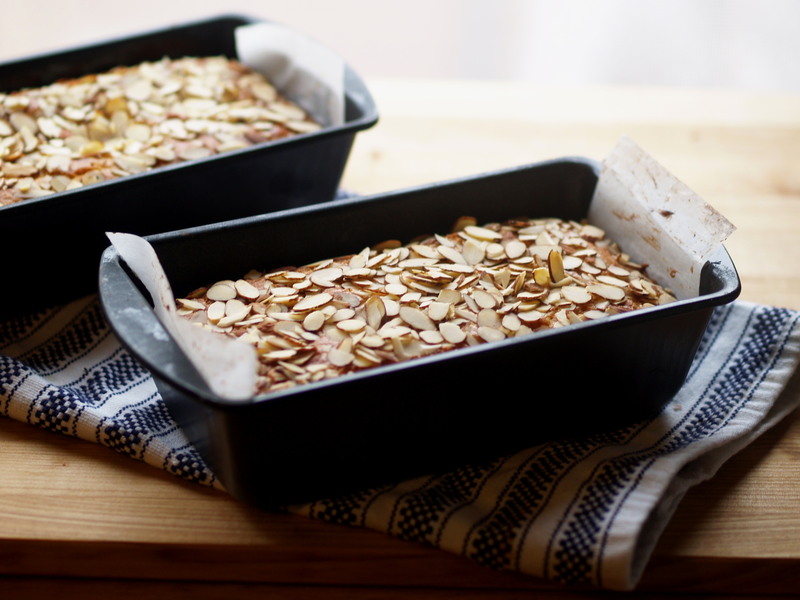 Sprinkle the sliced almonds evenly over the top. Bake. Bake for 50 minutes (the original recipe recommends 40 minutes) or until a toothpick inserted in the center comes out clean.